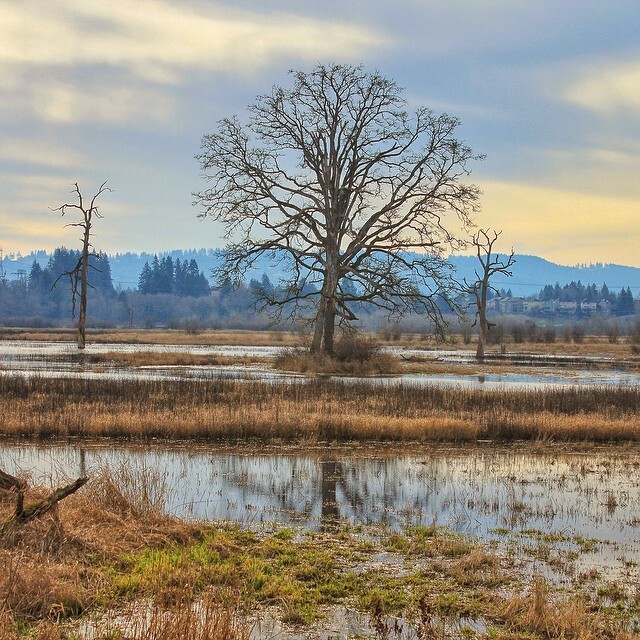 Jerry Johnson’s winning pictures of the Tualatin River National Wildlife Refuge in Sherwood. While winter may not be your first thought for the best months to go bird watching in the Pacific Northwest, Tualatin Valley’s bird watching scene truly is hopping (or should we say soaring?) every month of the year. Just minutes away from the urban buzz of Portland, there are the chirps and tweets in Tualatin Valley’s wetlands, nature preserve and nature parks. Celebrate National Bird Day in Oregon on January 5…or any time, really. Less foliage means there are fewer leaves to obstruct your view of migrating birds. Spotting not only birds, but also their tracks and signs of foraging, is much easier in the winter months. With fewer resources (i.e. food! ), the winter months encourages several species of birds to congregate in a mixed flock. Check multiple birds off your “must-see” list at once. This phenomenon is best seen, well, now. An average of 20,000 waterfowl—including Canada Geese, northern pintails, mallards and even Bald Eagles—can be observed in one day at the Tualatin River National Wildlife Refuge. That’s a lot of birds. Additionally, Jackson Bottom Wetlands is a hangout for American Wigeon and Great Blue Heron. While Tualatin Valley doesn’t typically have snow on our trails, there are always a few days that do. Our winter weather resource page has links to road updates, live cams and more. From fog to rain to snow, be sure to dress for the weather of the moment. That means rain gear, good boots or whatever else will keep you warm and dry. It’s not the height of summer, but you can still get dehydrated. A pack of water, snacks and sunscreen is all a part of the adventure. Keep valuable gear protected from winter elements. We suggest a harness or neck strap attached to a pair of water-resistant binoculars. Planning your Tualatin Valley trip? Be sure to book a hotel room close to the trails. Because chickens are birds, you can keep “birding” as you visit the resident garden chickens at the McMenamins Grand Lodge. Your morning omelet is thanks to their super fresh eggs.